Nuku and her eight year old daughter, Evelyn at Mele Maat Primary School. Nuku’s family escaped serious injury 20 minutes before their family home was flooded and completely destroyed. 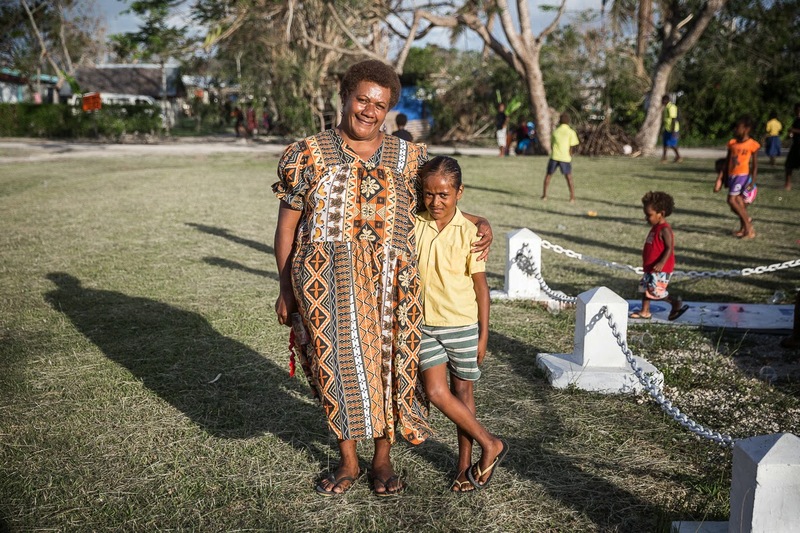 It took mother of four, Nuku Kilorie and her family 20 terrifying minutes to reach safety when Category 5 Tropical Cyclone Pam struck Vanuatu, completely destroying her family home on March 13, 2015. Their dash to safety also meant crossing the Tebokoa River. In normal times the river poses no threat to anyone but, on this night, it burst its banks, sending a chest-height raging torrent of water, debris and coconut trees through the village, destroying everything in its path. Nuku fights back tears as she says “We were inside the house and we were not worried about the river because it’s not big and it wasn’t raining heavily. We were praying in the house when the winds came and all of a sudden I heard my brother screaming for us to come out. Then we heard the river breaking the strong bamboo growing on the river banks and saw that the river was now right next to the house. Half of our roof was gone. My children were crying and I thought the river would take us away and we would die”. By the time Nuku’s brother had helped her carry her children across the raging river to a large shop where many other people had sought shelter, the river had flooded the shop floor, forcing people had to sit on chairs while waiting for the rain to subside. Nuku’s eight-year-old daughter, Evelyn, a fourth grader who attends Mele Maat Primary school along with her brothers, was devastated the next morning to discover that her school books were buried in thick mud from the river which had flooded their home and destroyed all their possessions. The cyclone also destroyed four of the school’s classrooms. “Evelyn didn’t want to go to school when they announced school was starting again. My children cried because they didn’t have their books and they were also frightened because Cyclone Pam destroyed the classrooms at her school. But education is important so I told my husband to borrow some money to buy books for the children so they can go back to school,” Nuku adds. Nuku’s husband doesn’t have to borrow money to buy school supplies for his children. Evelyn and her two brothers will each receive a school back pack with essential supplies such as books, pens, pencil, rul-er, eraser and crayons as part of UNICEF’s support to ensure children return quickly to school after the disaster. UNICEF has supplied the school with one for each of its 570 students, in addition to four class-room tents and ‘school in a box’ resource packs. When Nuku is told her husband doesn’t have to borrow any money because her children will get the es-sential supplies they need for school her tears return for a different, happier, reason.